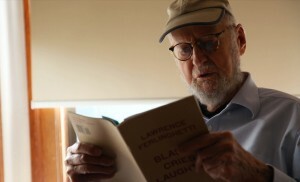 So, when KQED conceived of its Boomtown series, which seeks to put the Bay Area’s current boom-and-bust cycle in context, I thought who better to turn to than Lawrence Ferlinghetti, to reflect on the changes that gentrification and technology have made in his beloved city. Ever since the iconic poet, painter and publisher helped spark a literary renaissance in the 1950s with the “Beat” movement, Ferlinghetti has served as a conscience for San Franciscans, especially when times are tough. 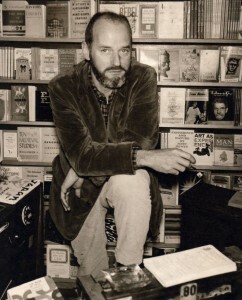 When Ferlinghetti arrived in the city in 1951 from New York, he settled into a $65/month apartment in the Italian working-class neighborhood of North Beach. That was the beginning of his journey to put San Francisco on the world’s countercultural map by publishing the work of beat poets such as Allen Ginsberg and Jack Kerouac. But 64 years after arriving in San Francisco, despite his status as a literary legend, the 95-year-old co-owner of the renowned City Lights bookshop and publishing house says he doesn’t feel so at home in the city by the bay anymore. He complains of a “soulless group of people” too busy with their phones to “be here” in the moment. “A new brand of dot.com millionaires and generally Silicon Valley money moved into San Francisco with bags full of cash and no manners and very little education in the great culture of Western civilization,” he told us when we went to visit him at his North Beach apartment last month. “In 1951 I had the feeling walking up Market Street … that the general attitude was that San Francisco really wasn’t part of the United States. They were sort of an offshore republic. … But that’s not the case anymore,” he told us. The George Krevsky Gallery in downtown San Francisco, which had shown Ferlinghetti’s work for two decades, was forced out of its building to make way for a cloud computing startup called MuleSoft. Krevsky now sells most of his artwork online — out of his home in the Oakland Hills. Some of Ferlinghetti’s works can be seen at Live Worms, a gallery on upper Grant Avenue, one of the few parts of North Beach that still feels bohemian. As part of its “Legends of the Bay Area” series, the Marin Museum of Contemporary Art in Novato is hosting a retrospective exhibition of Ferlinghetti’s art work through April 5. A day after our interview, Ferlinghetti left me a voicemail expressing concern that he struck too negative a tone and invited us back to his apartment for a second take. He wanted me and our audience to know that he still has hope. A version of this column first appeared on KQED and is reprinted here with the author’s permission.